Enterprise games have definitely changed the approach of corporate training. That is a sure thing. While eLearning games are getting more and more used by Instructional Designers, learners are already getting fed-up with this kind of training method, mainly because of their lack of interactivity. Fortunately, a new kind of tool starts to emerge: Interactive media authoring tools. Their benefits are simple: To enable trainers to deploy digital learning content and serious games quickly and easily, while adding interactions. If you feel like your games for learning are lacking interactivity and engagement from your learners, you should keep reading. When it comes to serious games for business, it is often difficult to fight against your worst enemy: Boredom. Indeed, classical eLearning modules, with linear content followed by a quiz to assess learners’ understanding, is not that exciting. Besides, with this interactive training software, you can also easily engage your learners, thanks to its several types of scenes. For instance, it is possible to import pedagogical content from Storyline and Captivate, and to go beyond with ITyStudio. 2. Interactive Media Authoring Tools Are Easy To Setup. Often, when speaking about serious game development, people tend to think that it is going to be complicated, that it will be time-consuming… In the blink of an eye, they suddenly feel overwhelmed by the project and give up. Strange as it may seem, interactive media authoring tools simplify the process. As stated earlier, a lot of them are easy to use and intuitive: Games for corporate trainingcan be designed in a matter of days, without requiring any specific training. 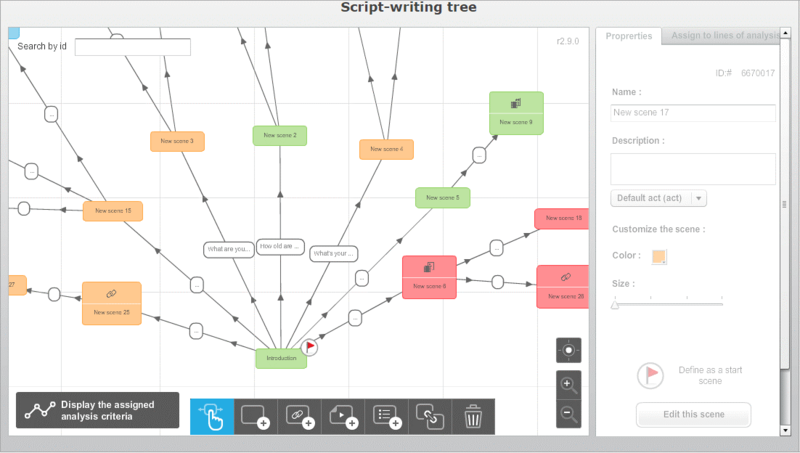 For instance, in order to set immersive situations, and to add storytelling to your scenarios, ITyStudio has developed an interesting tool: The scenario tree. Thanks to this game-based learning software, it has never been easier to edit scenarios that engage learners. Well, after complexity, the next excuse people often use before choosing a game-based learning platform is, indeed, its costs. First off, you have to know that interactive media authoring tools are more affordable than before, making it a really cost-effective solution for your organization. For instance, the 3D simulation software ITyStudio has several pricing proposals, starting at $220/month, and allowing you to make your serious game design without any limits! For more detailed information, feel free to visit their pricing page. Trainers only have to create the training simulation one time. Once their serious game design is done, content is ready to get deployed and put in front of learners, without needing any additional action from their side. Indeed, classroom training always requires your team to move and meet at the same place. Often, people have to travel the world in order to reach the headquarters. Thanks to interactive media authoring tools, you can now enable them to get trained anytime, anywhere. Thus leaving your employees with more time and energy to get more things done for your organization. 4. Deploy It On Tablets And Smartphones. Times have changed. Even if computers are still used a lot in our world, they are not the only one anymore: Others devices such as tablets and smartphones are trending. And guess what? Among the several advantages of online training, there is one crucial: You can leverage your pedagogical content and spread it on those devices. 5. Measure The ROI Of Your Learning Simulations. Last but not least: The evaluation part. Of course, at the end of the day, your goal as an instructional designer is to transmit new skills to your learners. The great thing about interactive media authoring tools is that you can easily keep track of what is going on, in order to see if learners are on the right way or not. However, in order to access this data, it is mandatory to export your serious games at the SCORM format. SCORM compliant authoring tools can help you in this regard. Ready To Leverage Interactive Media Authoring Tools In Your Organization? Take Action! In this article, we shared with you 5 tips and tricks about interactive media authoring tools.